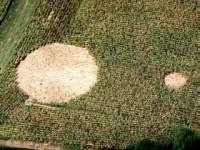 Crop circles - Benatecka Vrutice 2008. Explanation, decipher, decode, discovery, break code, explaining, decryption, puzzle out, scientific research. Lightning registered as light and sound, 1800 m from the hit point. Visited after several hours. Immediate controll of the lightning hit point, 3 hours after the lightning. It was a storm accompanied by an extraordinary heavy rain. 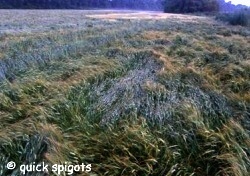 Location visited after two or three hours, lodged (damaged barley) area estimated at 80% of whole field. Surrounding fields unchanged, almost without flattened crop, even the closest neighbors across the field path. Rather, their state unchanged since on some of them there were lodged areas before, all continuously recorded and documented. 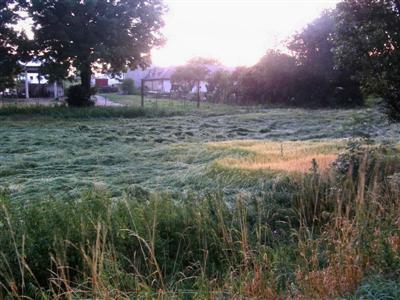 Consulted with a local farmer, controlling the state of the field immediately after the storm, found that before the storm did not lay in the field even a blade. The rest of the field to about more than 95 % lodged (flattened) over the next following weeks. 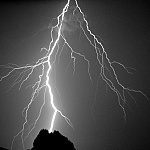 Photographs taken not later than three hours after the lightning shot. Thanks to information from local agriculturist, there were no lodging (damaging, weakening) on that field before thunderstorm. Other fields, just adjoining this one, remained almost untaken. Lightning hit not extremely strong (peak 6000 A, maybe called "a little", below-average), but the rain was really extremely strong and heavy, several tens milimeters of rainfall during less than a hour. Maybe significantly changed (lowered) electrical resistance of earth surface, also plants, and thanks to that would became such an extensive changes in minutes, because electric current passed through the whole field surface. Thanks to that were actually affected by electricity plants almost on the whole surface. Again should be emphasized, despite the extreme precipitation, heavy rainfall are other fields untouched, but the field affected by lightning is lodged (damaged, weakened) almost completely across its whole area (estimated at over 80%). 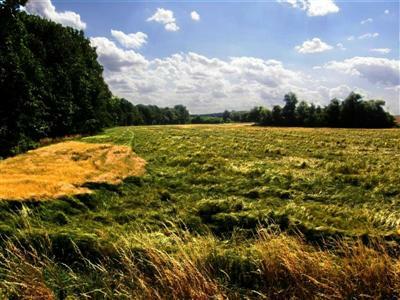 The field has a relatively complex shape, see accompanying sketch and map, making it almost impossible a local meteorological phenomenon and its local action so that it only affected this field, without noticeable interference of neighboring fields, separated only by a field path.